All of Oodles' great tasting yogurt flavors are made with the freshest, highest quality ingredients. Few foods help meet your nutritional needs at every stage of life better than yogurt with live and active probiotic cultures. And because it comes in so many flavors and varieties, yogurt appeals to every member of the family. 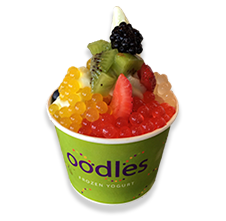 Oodles Frozen Yogurt is naturally low in calories, low in fat and high in protein making it a healthy choice. Then add on your favorite fresh fruit toppings and you have a treat that is: Scrumptious, Delicious & Nutritious.